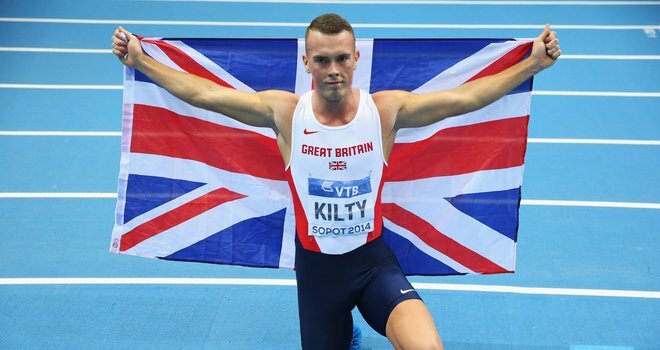 First and foremost, I want to congratulate Richard Kilty and his coach Rana Reider on his 60 meter Indoor World Championship Gold medal in Sopot. Now for a full disclosure. I really don’t care what “colour” he is… white, black, green or purple… to me, a sub 6.50 60 meter is enough to impress me. The question is, can he sustain his training and break 10 seconds? Are there any extrapolation “formulas” that will determine his 100m time based on his 60m? Well, the only way to find out is when Richard Kilty runs 100 meters! When Dwain Chambers ran 6.42 winning the 2009 indoor Euro Championships 60 meters, I came up with the raw extrapolations, which is approximately 1.53 or 1.54 of your 60m time. But Ireland’s Ian Graham had some interesting statistics to point out. Will Richard Kilty join the sub 10 club??? In the 14 world indoor championships from 1987 through to 2012 every single man that has dipped under 6.50 seconds in the 60m final, has a sub 10 second personal best for 100m. Will the 2014 winner, Richard Kilty, join them in the sub 10 club??? 1995 was the first championships won in sub 6.50 seconds, when Bruny Surin won in 6.46 seconds in Barcelona. All three medallists went sub 6.50 at the 1999 world indoors in Maebashi. Greene 6.42, Harden 6.43 and Gardener 6.46 seconds. 2001 in Lisbon, Tim Harden went 6.44 to take gold with Tim Montgomerys taken silver in 6.46 seconds. Justin Gatlin won in 6.46 seconds in 2003 in Birmingham. Jason Gardener then won in 2004 in Budapest with 6.49 seconds. Dwain Chambers won with 6.48 seconds in 2010 in Doha, and Justin Gatlin won for a second time in Instanbul 2012 with 6.46 seconds. Surin and Gatlin are the only two men to win the title twice. Bruny doing it back to back with wins in 1993 (Toronto) and 1995 (Barcelona). Justin winning in 2003 and 2012, both times running 6.46 seconds. Across the history of the world indoor championships 60m final, from 1987 to 2012, there’s been a total of 10 sub 6.50 clockings, and all 10 of those athletes have sub 10.00 second clockings. The odds are in Kilty’s favour… so let’s see if he can follow the pack, and bust out a sub 10.00 second performance this summer.